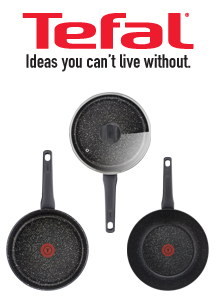 The new Everest range of pans from Tefal has been specially designed with Titanium Mineralia. Featuring easy cleaning non-stick coating making cooking a easy task, the Everest is set with the patented Thermo spot so you know when the pan is perfect for cooking. These pans are suitable for all hobs, are oven safe up to 175˚ and are dishwasher safe.